We want patients with non-healing wounds to be free of pain and discomfort. And we want to make life easier for the people who care for them. 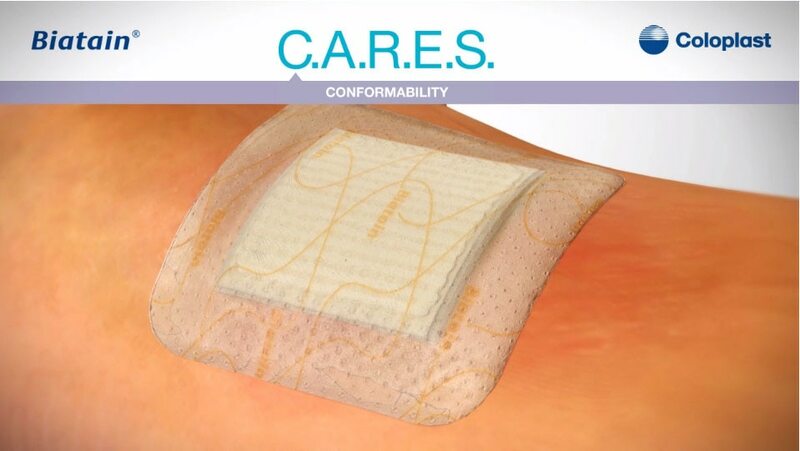 Our advanced dressings are developed through open, ongoing conversations with end users and healthcare professionals. We work together to achieve the same goal; accelerate healing, provide optimal comfort and simplify wound care. This animation shows how Biatain Cares for the patient, the wound and the outcome. The unique 3D foam structure of Biatain foam absorbs exudate vertically and swells to conform closely to the wound bed creating an optimal wound healing environment. The combination of superior absorption and retention properties minimises the risk of maceration and leakage making Biatain the simple choice for faster healing. The new Biatain Silicone delivers a gentle and secure fit for superb patient comfort and uncompromised superior absorption. The Biatain foam swells to conform closely to the wound bed creating an optimal wound healing environment. The gentle silicone adhesive ensures the dressing is easy and pain free on removal.